Summer salutations to all! It’s Andy Gesner and the staff at HIP Video Promo bringing you a brand new video that is sure to please your rock and roll senses! As Mike Chunn points out in Stranger Than Fiction, his eloquent biography of Split Enz—New Zealand is a long way away: tucked in a remote corner of the globe and separated from the continents by hundreds of miles of ocean. At the same time, it’s familiar – English speaking, possessing an economy not dissimilar to Scotland’s, and a climate reminiscent of parts of the American Northwest. Peter Jackson filmed his LOTR movies in New Zealand because the islands look like a magically-altered version of terrain we already know well. Similarly, bands from NZ have always taken traditional pop elements, and skewed and bent them until they feel peculiar and even mesmerizing. New Zealand recordings are often quiet, quasi-mystical glimpses into a guarded world; thus, they take awhile to hop oceans and reach stateside audiences. But when they do arrive, they tend to make an immediate impact on fans of unusual pop. 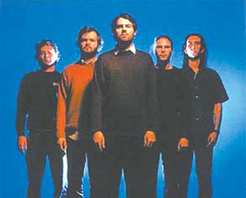 The Phoenix Foundation became the toast of Wellington in 2004 with the release of Horsepower, their strange and beguiling debut. Now, thanks to Young American Recordings, the rest of the globe is finally getting a chance to hear what New Zealanders recognized years ago: this combo is as subtly irresistible as any alt-rock group in the world. The American release of Horsepower adds two extra tracks, and a bonus video for “Going Fishing”, the single. But it’s still the same record that won awards in New Zealand and vaulted The Phoenix Foundation to the forefront of the “kiwi rock” scene. Song titles (“Let Me Die A Woman”, “This Charming Van”) betray the band’s sense of humor – but there’s tremendous emotional intensity here, too. Singer and songwriter Samuel Flynn Scott’s tremulous voice always sounds on the verge of breaking, and he brings his characters to life with vivid detail. Much of the album is semi-acoustic, haunted, intimate, and warm – “Going Fishing”, the most energetic track on the set, marries an analog synth riff to a squall of electric guitar and an intoxicating vocal melody. Possible comparisons include The Chills, The Go-Betweens, and the brothers Finn themselves (indeed, Neil and Tim are Phoenix Foundation enthusiasts, and even toured with the young band in 2005), but the song bears the imprint of Scott’s singular sensibility and worldview. In the wake of the success of Peter Jackson’s efforts there, Wellington and suburb Miramar have become a major independent film center. Several local New Zealand filmmakers have recently come to international attention: Taika Waititi won an academy award for his short film Two Cars, One Night, and his first feature-length romantic comedy, Eagle Vs. Shark, will be released by Miramax this June. The Phoenix Foundation scored Waititi’s unusual love story, and several Scott songs feature prominently in the movie. The Napoleon Dynamite-style flick seems a good bet to be a leftfield summertime hit, and The Phoenix Foundation are poised to become as closely associated with Eagle Vs. Shark as The Shins were to Garden State. The clip for “Going Fishing” features plenty of images of the band driving on a country road and horsing around beside a typically gorgeous New Zealand lake – but there’s also footage from Eagle Vs. Shark, too. At times, there’s even an odd correspondence between what’s happening in the movie – usually some kind of awkward interaction between the two romantic leads – and the subtle interaction between the band members. Shots of furtive glances cast by shark-suited Loren Horsley toward geeky, oblivious Jermaine Clement share the same heartbreaking futility with the footage of the members of Phoenix Foundation, gathered around a tiny goldfish bowl, casting fishing lines in its direction and missing the aperture at the top. Thanks to our pal Josh Swade and the folks at Young American Recordings, we’ll have copies of Horsepower for all of your on-air giveaway needs, so don’t hesitate to drop us a line if you’d like to get your hands on some! The Phoenix Foundation will be touring the east and west coasts in June, so let us know if you’d like to go to one of their shows here in America or perhaps sit down for a video interview. If you need more info, call Andy Gesner at 732-613-1779 or e-mail us at info@hipvideopromo.com. You can also visit www.ThePhoenixFoundation.co.nz to find out more about The Phoenix Foundation.